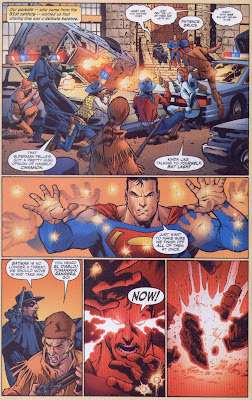 Matching Dragoons: Superman/Batman #16 "Absolute Power"
"Absolute Power. Chapter 3: When Time Goes Asunder..."
I know this is not chronological but I like it and wanted to have something short and sweet, so let's take a peek at a guest appearance of the scar-faced bounty hunter. The knife through the hand would make me say a whole lot more than GAH. But I'm not the goddamned Batman, now, am I? 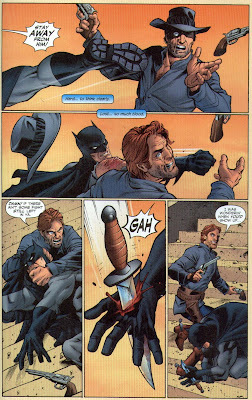 I also enjoy the how Jonah is trying to snap the goddamned neck of Batman. 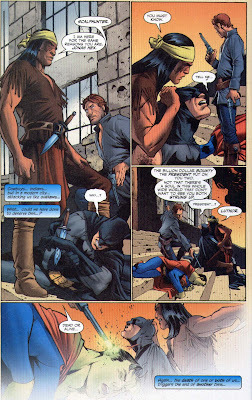 The scene ends with Batman getting sliced and Supes taking a final fatal bullet to the head. Of course, in this story, when either one of them dies, they phase to another earth. All told, a good story arc that I think is in trade and a very nice appearance of Jonah Hex. I would have preferred that he was written a little more along the lines of how Fleisher wrote him in regards to how they spelled his text. But that's a minor quibble. I would like to see these artists do an issue of the current series. Anyway, have a nice Fourth and next week we'll take a look at the landmark 50th issue of Jonah Hex. It's the pivot point where we can finally start dating almost every Hex book. Correction: S&B fight Darkseid ina prior story arc. 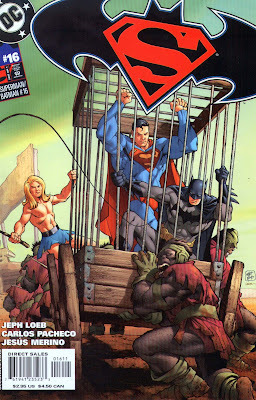 Absolute Power is about what happens when the past is changed and Kal-El and Bruce Wayne are raised by super-villains. Holy Guacamole! 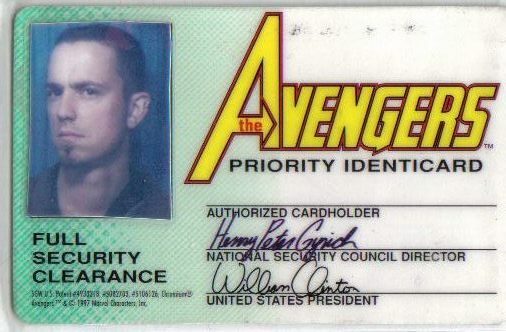 Now this is something that I hadn't seen before. Nice that Scalphunter showed up, I too, was wondering where he was. I hope that you are barbecuing. Wait...Jonah just up and figured, maybe "space rock" would kill a "space man"? Did anyone give him a head's up on that one? Honestly, you know everything I know because the only thing I didn't show you was a one page panel with Superman protecting Batman on the steps. Jonah ain't a dummy. You need a space bullet to kill a space man. Maybe someone did tell him, be we'll never know. Wwasn't it established that Luthor was President? 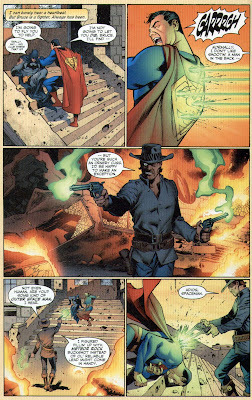 That would be how Jonah Hex knew to use 'Moon-Rock' in his gun! The red shirt is probably Johnny Thunder. The man in red is most likely Johnny Thunder.